Equipped with Poulan Pro all-new 120cc power series engine, the PR120N20S gas-powered push lawn mower is designed and engineered for excellent balance and low vibration. It features a compact 20-inch side discharge cutting deck that disperses grass clippings evenly, adding vital nutrients back into your lawn. With four cutting height positions and heavy-duty steel construction, this nimble mower not only provides exceptional cutting, it's also super-easy to manoeuvre in tight spaces. This single speed front wheel drive self-propelled mower has a 159cc Columbia engine and is equipped with rear bagging, mulching and side discharge capabilities. Easily adjust the deck height with two levers. The deck wash kit makes cleaning your mower deck easier. 120cc Push Gas Lawn Mower 20 inch, PR120N20S Equipped with Poulan Pro all-new 120cc power series engine, the PR120N20S gas-powered push lawn mower is designed and engineered for excellent balance and low vibration. It features a compact 20-inch side discharge cutting deck that disperses grass clippings evenly, adding vital nutrients back into your lawn. With four cutting height positions and heavy-duty steel construction, this nimble mower not only provides exceptional cutting, it's also super-easy to manoeuvre in tight spaces. 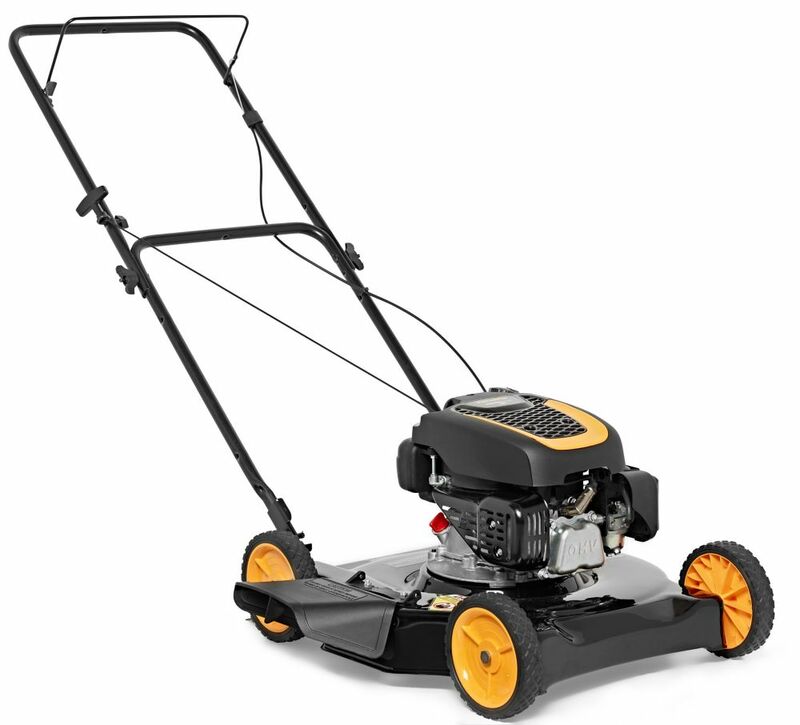 120cc Push Gas Lawn Mower 20 inch, PR120N20S is rated 2.3 out of 5 by 3. Rated 1 out of 5 by Holl from Poulan Push Mower Won't Start I bought a cheap Poulan push mower for trimming; in less than 6 months it won't start. I replaced a 20 year old Murray mower with the Poulan. Should have kept the Murray. Poulan mowers aren't reliable or worth the money. Rated 5 out of 5 by Troubleshooter from Starts first time EVERY TIME I purchased this Mower 3 and a half months ago and it has started first time every time following the recommended starting procedure. I was looking for an inexpensive mower that was simple and easy to operate and I am very satisfied with this mower. I could not be happier.